I'm Dan Oaks, President of DVO Enterprises, and am VERY interested in your satisfaction. My staff and I are committed to making Cook'n the best recipe software possible. We've been doing recipe software for over 15 years and we're really good at it! 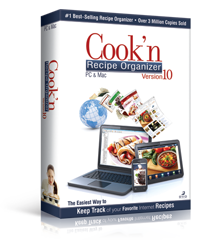 In fact, Cook'n has become the #1 best-selling recipe software on the market. Cook'n has a 200% guarantee so you can't lose!